The final week of the regular season in Utah is headlined by a 5A Region 3 showdown. 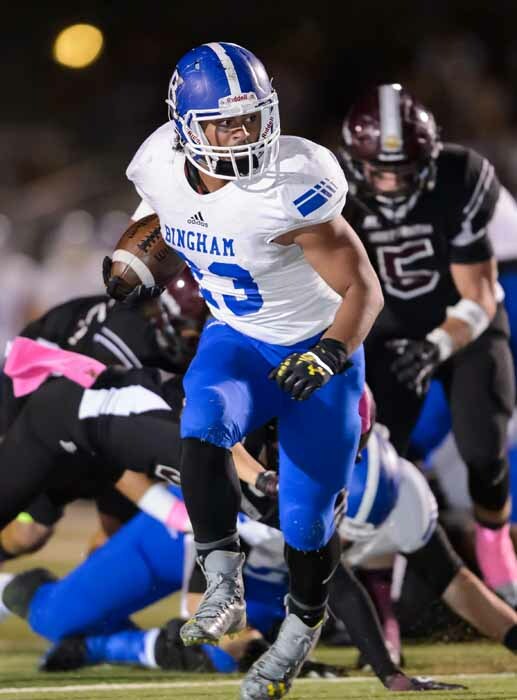 Bingham (South Jordan, UT) is riding a 34-game, in-state winning streak and is ranked just outside of the Top 50 in the HSFB100 at No. 51. Brighton (Salt Lake City, UT) is 7-2 and was ranked in the HSFB100 Preseason Poll; with a win it would force a three-way tie for the region championship between the two and Jordan (Sandy, UT). Jordan beat Brighton 51-49 back in September and Bingham is coming off of a 56-42 win over Jordan — in a game that wasn’t as close as the final score may indicate. The game between the Miners and Bengals is one of the most highly anticipated of the year. Not many teams can replace a three-star quarterback and see an increase of offensive production but that is exactly what Bingham has done. After relieving BYU-bound Keaton Torre and throwing for three touchdowns against Bishop Gorman (Las Vegas, NV), junior Matt Degn has forced his way into the starting lineup. – its punishing run game. Head Coach John Lambourne spoke of the grueling attack after the win last week. Jahvontay Smith, Brady Atkin, and Elvis Vakapura form a trio of talented ball carriers that have the benefit of running behind the unforgiving offensive line. Prior to allowing the most points it has in a game all season last week, the Miners defense allowed a total of six points in a four game stretch. It also owns five shutouts on the season. The front seven has four future college players that are largely responsible for the success on defense. Senior linebackers Simian Matagi and Air Force commit Parker Workman are both rated two-star recruits. Four-star Jay Tufele and three-star Langi Tuifua, an Oregon commit, form one of the top defensive line duos in the state. They will get a Brighton offense that is averaging 35 points per game. Quarterback Andrew Covey is the third player to line up under center this season for the Bengals — and is coming off of his best game of the season where he tossed six touchdown passes and throwing for 201 yards against Copper Hills (West Jordan, UT). Covey is also a threat on the ground with 357 rushing yards and three touchdowns. He will have one of the best receivers in Utah High School football history to throw to in four-star Stanford commit Simi Fehoko. The senior has 51 receptions, over 1300 yards and 15 touchdowns on the season. Junior running back Sione Lund, also rated a four-star as a linebacker, has rushed for 1,094 yards and 14 scores. Lund leads the defense with 96 tackles and five sacks. Fehoko plays both ways as well, grabbing three interceptions from the safety position. 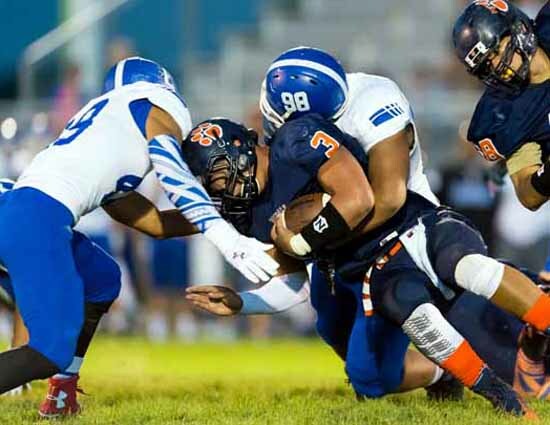 Jackson Kaufusi is rated a three-star athlete and is second on the team with 84 tackles as an outside linebacker. The senior holds offers from BYU, Cal and Utah among others. Senior defensive back Drew Jensen is a three-star BYU commit that started the season at quarterback for the Bengals, but was injured on opening day and is just returning to action. Last season, Bingham won 24-0 but the Bengals have too much firepower this year to be held out of the end zone. The key matchup in this game will be between the defense of Brighton and the offense of the Miners. If Brighton can slow down the heavy rushing attack, it can stay in this game. If not, Covey and Fehoko will need to put up video game-like numbers to pull off an upset. Coming off of a 21-point loss at the hands of St. John Bosco (Bellflower, CA) — which was much worse than the final indicated — Mater Dei will look to rebound this week against the Friars. The wounds for the Monarchs may be deeper than they appear, as it trailed 42-0 late in the third quarter last week, before rattling off 21 straight points to cut the deficit in half. Freshman quarterback JT Daniels came back down to earth, completing only 37 percent of his passes — by far his lowest of the season. He did, however, throw for over 200 yards and three touchdowns after the game was all but decided. Daniels has now thrown for 1,684 yards and 21 touchdowns in six games and has only thrown one interception. Senior Andre Collins is the veteran in a group of next-level receivers, followed by a trio of underclassmen in Chris Parks and St. Brown brothers- Osiris and Amon-ra. Senior running back Brandon LaMarche was also slowed by the Bosco defense, being limited to just 61 yards on 14 carries. The offensive unit should perform far better this week and will look to get in the end zone much earlier in the contest. For the Friars, it will likely be backup quarterback Aaron Simpson behind center after junior three-star Tyler Lytle suffered a shoulder injury two weeks ago against JSerra (San Juan Capistrano, CA). Last week, Simpson threw for 269 yards and added two touchdowns on the ground. He will have four-star junior receiver Terrell Bynum to throw to. Bynum leads the team with 27 receptions, 435 yards and two touchdowns. Senior running back Jackson Taylor will get the bulk of the work on the ground. He is up to 348 yards and five touchdowns in the pass-heavy, spread offense. The defense that will look to slow down the passing attack of Mater Dei will be led by a trio of collegiate-level defensive backs. Seniors Tre Webb and Keyon Riley are both rated three-star recruits and have combined for three interceptions. Junior Keith Taylor is rated a four-star recruit. Senior defensive linemen Daniel Garcia leads the team in both tackles and sacks. Mater Dei has won the last three matchups against Servite but the last two by only a combined 10 points. The rivalry game is usually decided in in close fashion with four of the last five contests being determined by a touchdown or less. Servite has shown it is capable of staying in games thus far in Trinity action by way of a one point win and a one point loss but this week should be different. An angry Mater Dei team should pull away with a double-digit victory. Coincidentally the top two teams in the 5A Region 4 will also square off in the final week of Utah’s regular season with the region championship on the line. Both Lone Peak and Herriman have made it through its region unscathed to this point. That will change after the winner-take-all game is decided Thursday night. Lone Peak is looking to finish the year undefeated for the first time since its state championship season in 2011. The team has won all nine games to this point by an average score of 40-12. Senior quarterback Talmage Gunther has coordinated a balanced offense throwing for 1,316 yards and 22 touchdowns and rushing for 535 yards and six more scores. Tyler Kap leads the team in rushing yards with 575 and has six touchdowns. Three-star junior running back Jackson McChesney, a BYU commit, is a do-all threat for the Knights with nearly 800 combined yards on the ground and through the air with nine total scores. Senior receivers Jon Christensen and Tyson Doman have each caught seven touchdown passes. Christensen leads the team with 32 receptions and 428 receiving yards. Junior free safety Seth Corry leads the team with 52 tackles and defensive back Nate Bennett has three of the teams 11 interceptions. Defensive linemen Preston Lewis and Terrence Levy have combined for 11.5 of the teams 21 sacks. Both interceptions and sacks may not play a huge roll in this game for Lone Peak, as Herriman will keep the ball on the ground for most of the game. Sophomore quarterback Hayden Reynolds has thrown for 493 yards and six touchdowns but has given way to the running game for most of the season. Senior Kaden Strasters has rushed for 622 yards and 11 scores with Brig Rush right behind him at 564 yards and three touchdowns. Jake Jutkins and Noah Vaea have combined for over 700 yards and three touchdowns each as third and fourth options out of the backfield. Vaea is also one of the most valuable players on the Mustangs defense. He leads the team with 60 tackles and also has an eye-popping 11 interceptions. The team has 19 interceptions all together, an area that it will rely on to keep it in this ball game. Senior defensive end Leki Fotu has 57 tackles and leads the team with 6.5 sacks. Fotu is rated a two-star recruit and is committed to Utah. Lone Peak appears to be too balanced on both sides of the ball to fall at the hands of Herriman but if Vaea and Fotu can create turnovers for the Mustangs, an upset is certainly possible. If Lone Peak pulls out the win, it will likely claim one of the top two seeds in the 5A state playoffs. Following a dramatic come from behind victory last week, Mission Viejo will have another tough South Coast League challenge this week. It will face its second four-star quarterback in as many weeks, in San Juan Hills Patrick O’brien. Both teams enter the game undefeated and the winner will claim pole position of not only the South Coast League but the West Valley playoff seedings, as well. Senior quarterback Brock Johnson led a wild comeback last week against Tesoro (Rancho Santa Margarita, CA) after the Diablos trailed 23-10 at halftime. Johnson rallied his team by throwing for three touchdowns in the third quarter and leading a scoring drive in the fourth quarter capped off by a four-yard touchdown run by running back Isaiah Miller. The late touchdown followed by a two-point conversion was the fifth and final lead change of the game resulting in a 39-33 victory for the Diablos. Johnson threw for 261 yards and three touchdown passes. Olajiah Griffin, Jason Lee, and Austin Osborne all secured touchdown grabs in the receiving game. Miller finished with 120 yards on the ground and two scores. The 33 points was the most allowed by Mission Viejo all season. It will look to correct some of the mistakes that were made and slow down Nebraska-bound O’brien and San Juan Hills. The Stallions enter the game averaging 47 points per game largely due to the arm of quarterback Patrick O’Brien. The senior has completed 80 percent of his passes for 1,998 yards and 21 touchdowns. 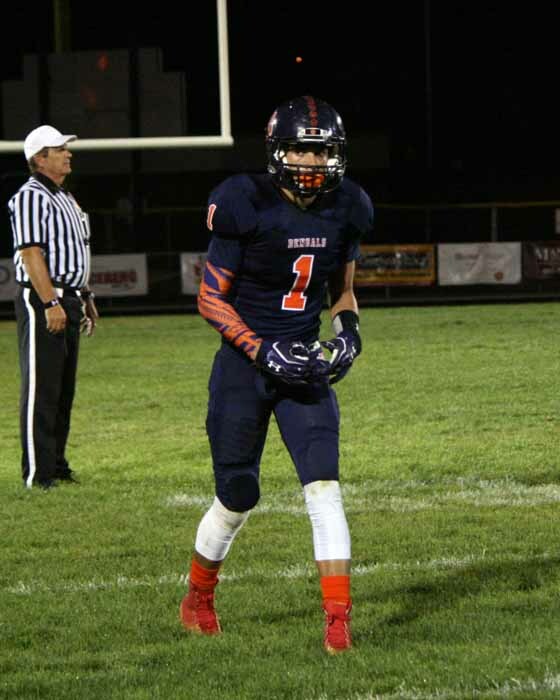 Junior receiver Jacob Huff serves as his main target with 57 receptions, 986 yards and eight touchdowns. Eight other players have recorded a touchdown reception on the season. A pair of junior running backs compliment the passing game in Brock Cazel and Cole Suchesk. Both backs have rushed for over 300 yards and have combined for 12 rushing scores. Defensive back Cameron Buchanan leads the team in tackles on a defense that averages 21 points allowed per game. Linebacker Tim Newman has 61 tackles and leads the team with three sacks. Devin Wegis has recorded three of the teams’ eight interceptions from the secondary. In what will be the biggest game in San Juan Hills football history, the defense will need to play on another level this week if it can knock of traditional league power Mission Viejo. Fresh off of a near scare for the Diablos, expect coach Bob Johnson to have the team ready to come out as focused as ever. It should be another hard fought battle between two great programs but Mission Viejo likely comes out on top. The only thing that can slow down Folsom lately was its bye last week. Prior to the week off, the Bulldogs outscored its last two opponents by a combined score of 87-7. Senior quarterback Jake Jeffrey continues to impress as the converted wide receiver has thrown for 1,771 yards and 21 touchdowns. His main target, Christian Huber, has caught 33 passess for 542 yards and six scores. Senior running back Tre Green rounds out the offense with 542 yards and 12 touchdowns. The team is averaging nearly 42 points per game through the first seven games of the season. The defense is headed by senior linebacker Roger Neal. Neal has 85 tackles on the season, just behind team leader Matt Torres who has 86. Junior defensive lineman Ariel Ngata leads the team with four sacks and junior defensive back Drake Stallworth leads the team with three interceptions. It will face off with a Rocklin team that is trending up as of late. The recent return of three-star defensive end Chase Hatada has been a big factor in why the Thunder have only allowed three points in each of its last two games. Hatada, a Boise State commit, missed the first five games of the season due to a knee injury suffered in the preseason. In his return two weeks ago, the senior recorded seven tackles, two sacks and forced a fumble in what could have been the beginning of a transformed defense. Prior to Hatada’s presence, Rocklin was allowing 26 points per game. Senior signal-caller William Floyd will aim to match the production of his counterpart by hooking up with leading receivers Wesley Preece and Kier Gibson-Adams. Running back Evyn Holtz will see the majority of the work out of the backfield. The offense of the Thunder is averaging 36 points per game- a number it will likely need to reach if it can pull of an upset. The presence of Hatada is certainly worth keeping an eye on but he will likely have to go through four-star offensive lineman Jonah Williams, an Alabama commit, to have a major impact in this game. Look for the Folsom to continue its winning ways on its quest for another Sierra Foothill League title.